The Objective of WP2 is to provide a common starting point for other work packages in the project. 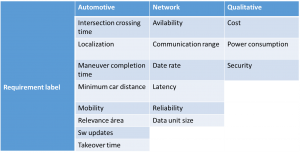 This WP details the potential use cases, thoroughly analyze their requirements and define relevant Key Performance Indicators (KPIs) requirements of the future 5G ecosystem in the context of the automotive sector. These results are available in D2.1. The current underlying business models were studied and emerging new businesses and players were investigated. Also, certain spectrum issues from the perspective of requirements and limitations were considered. These two items belongs to D2.2 deliverable. In D2.1 5GCAR has defined five Use Case Classes (UCCs) taking into consideration the different sets of operations required by cooperative and automated vehicles. Each UCC enables a different functionality and consists of various use cases. Each use case analyses the respective functionality or operation in a different context (i.e., road conditions, road environment, level of automation etc). 5GCAR has selected one relevant and representative Use Case (UC) from each of the Use Case Classes (UCCs) taking into account their impact (e.g., societal, safety purposes, business opportunities), their frequent occurrence in future highways or urban environments and the challenges that they set for the communication system. For each of them, a study based on Key Performance Indicator (KPI) have been made focusing into three categories: automotive requirements, network requirements and qualitative requirements. Lane merge: Localization, Latency. In order to help to prepare the maneuver safely and in a comfortable way. See-through: Data rate. Because video streaming may provide an important data rate depending on the video quality and the number of cameras involved. Network assisted vulnerable pedestrian protection: Reliability, Localization. A pedestrian has many different trajectories and is not as predictable as other road users, so the accuracy and the reliability of the location information is crucial to increase their safety. High definition local map acquisition: Localization, Density, Security. 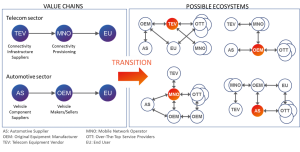 In this use case the density of the elements in the road may suppose a real technical challenge for 5G networks. Remote driving for automated parking: Availability, Reliability, Latency. This is a main example for what it is known as URLLCC (Ultra Reliable Low Latency Critical Communications) in the vertical automotive, with severe needs in terms of low delay and high reliability. The scenario definitions and requirement specifications work in D2.1 serves as input for the technical work in the project. The objectives of the business model part of this study are to identify how 5G can enable new business models, based on new technologies and features of 5G. On the high level we could argue that the two key technology enablers are: an innovative Radio Access Technology (RAT) for V2X communications, enabling both infrastructure based and sidelink based communications and the virtualization of the communications network, from the radio to the core. There are technical features in 5G that can enable new business models for various stakeholders in the value chain. Network slicing and mobile edge computing are examples of such features. Existing services as well as autonomous driving features and convenience services may be enhanced by 5G technologies, thereby building added value in these services. The value chain as it looked at the writing of D2.2 (Q1 2018), may be disrupted by 5G, driven by new 5G technologies, as well as changing eco-systems around the connected car, where a rapid digitization of existing industries is complemented by new types of digital and industrial stakeholders. The 5G Automotive working group white paper [5GP18-WP] published by 5G PPP as a first outcome of the automotive working group concerning analysis of the 5G V2X deployment cost, triggering a discussion on revenue and benefits, and taking into consideration that advanced driving solutions will be first applied in highways (deployment of 5G digitalized highway) to enable safe transportation. The objectives of the spectrum analysis part are to identify appropriate spectrum usage alternatives for enabling advanced ITS and automotive services and applications using 5G technologies. This includes a survey of the already designated ITS frequency bands as well as licensed frequency bands for IMT systems including 5G on their suitability for V2X communications in different regions of the world. The usage of 5.9 GHz band for ITS services and applications using short-range vehicle-to-vehicle (V2V) and vehicle-to-infrastructure (V2I) communication is harmonized in many regions of the world. Licensed frequency bands for mobile networks over the world are available and suitable for providing vehicle-to-network (V2N) communications. To fulfil the requirements of advanced 5G mobile services, including ITS and automotive services, new 5G spectrum are being identified in different regions of the world. The frequency bands mainly fall into three ranges: 600 MHz / 700 MHz in the low frequency range, 3.1-4.2 GHz and 4.4-4.99 GHz in the mid frequency range, as well as 26/28 GHz and 38/42 GHz in the high frequency range. The combination of 5G candidate frequency bands in the low, middle, and high frequency ranges in different regions of the world will enable ITS and automotive services that have requirements of both large coverage range and high system capacity. According to the 5GCAR use cases analyzed in the project, the better spectrum bands seem to be in the medium or low frequency ranges with lower propagation loss and better coverage range. Coverage has precedence over bandwidth for these identified V2X use cases. The uncertainty in spectrum usage remains. This uncertainty in spectrum usage has also impacts that may slow down the market roll-out and business development of V2X technologies. From a regulatory point of view, spectrum allocation should be technology neutral.